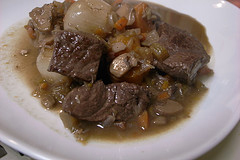 The photo above shows a classic Beef Bourguignon recipe, “Boeuf bourguignon servie avec des pâtes”. There are a few dishes that have made the South of France one of the most romantic and desirable destinations in the world. Beef Bourguignon is one of those rustic dishes that capture the charm and grace of south of France villas nestled in the countryside. Self catering holidays in the South of France are both enjoyable and a great opportunity to visit local markets. This recipe is particularly great for the local market shopping because of the enormous ingredient list. However, all of the items on this list can easily be found in local markets or at a standard grocery store. 1. Using a large sauté pan, pour a layer of water into the pan to cover the bottom over a high flame. Add the salt pork or bacon into the hot pan and cook until the water is evaporated. Reduce to a low flame. Add 1tbsp butter and continue to cook pork until it is brown. Remove the pork once it is cooked but keep the juice of the pork in the sauté pan. Place the pork in a large pot and cover with lid. 2. In the same sauté pan, add pieces of beef and sauté them until brown. It is important to not stir or continually flip the beef chunks. Doing so will reduce the flavour of the beef and will cause it to take longer to seer. Once the beef is brown, add it to the large lidded pot as well. 3. Add shallots and mushrooms to the lidded pot. Cook for 4 minutes, stirring frequently to keep the beef and pork from sticking to the pot. Then, add tomato paste and continue to stir. 4. Add brandy and stir, reducing this broth to half its current level. 5. Add 1 bottle of wine along with the parsley, thyme, cloves and bay leaves. Cover and simmer for 1 hour. Then, add carrots and simmer for another hour or until beef is very tender. 6. 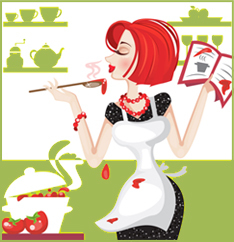 While simmering, chop the mushrooms and prepare the pearl onions. If using the recommended frozen pearl onions, be sure they are thawed before sautéing. 7. After the two or so hours of simmering, remove all beef chunks from the large pot. Then, strain all the contents of the pot into a strainer that is over a medium sized pot. Boil this broth for only 1 or 2 minutes. Set the broth aside. 8. Heat a new large sauté pan over a high flame and add the mushrooms for about 5 minutes or until a watery broth is extracted from the mushrooms. Then, add the onions and 3tbsp butter. Sprinkle a bit of salt over the mixture. 9. Returning to the sauce, turn the heat to low. Then, slowly and gradually whisk in the Beurre manié to the broth and stir constantly until it is absorbed. Stir in another 3 tbsp brandy and taste. 10. To serve this fabulous dish, cover the beef, carrots, mushrooms and onions with broth. Optional side dishes are egg noodles, French bread or mashed potatoes. 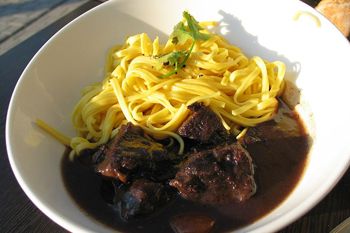 The photo above shows another classic Beef Bourguignon recipe.